Rat Terrier breeder with 13 years experience & 8 year pedigree (Generations). Their genetic history has been tracked for over 26yrs. Most breeders do not have this kind of history. 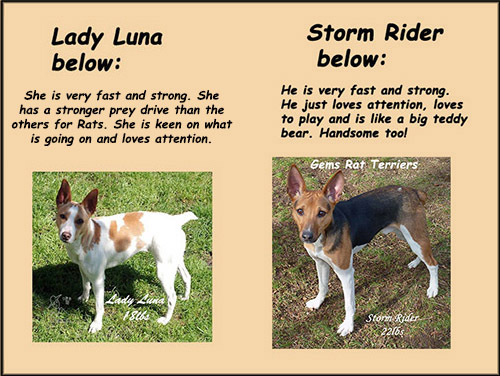 These are pure bred Rat Terriers and we guarantee they do not have any fatal or genetic diseases. We love our puppies and take pride in breeding the most healthy dogs. 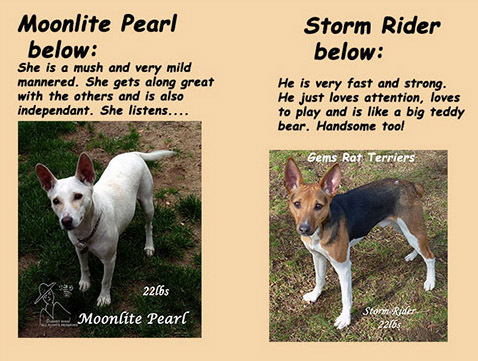 Pictures of Gemsrats puppies all grown up in their forever homes. Everyone has their own preference as to size, color, gender and temperament. A $150 non-refundable deposit will reserve a puppy for pick up at a minimum of 8 weeks old. You will get photo and/or video updates and watch them grow. If you reserve a pick of the litter and do not find a puppy, you can tranfer it to the next litter. The longer a puppy is here, the more they will know. All puppies are $1,100 including tax and will have 5 vaccinations; (Canine Distemper virus, Adenovirus type 1 (hepatitis) and Adenovirus type 2 (respiratory disease), canine Para-influenza virus, and canine Parvovirus. Dewclaws have been removed. They are de-wormed, have pure breed papers and we guarantee our puppies do not have illnesses in addition to any genetic diseases. We give a 3 day supply of food. We have crates, harnesses & leashes and jackets available that will fit your puppy if you need them. ***NEW PUPPY 8x10 PHOTO KEEPSAKE PUPPY BOOK*** This hardcover book includes professional pictures of parents, mother with litter newborns & puppy pictures from stages of your puppies growth since birth. $100. **New litters below. Click on parents names to see them. Puppies look bigger than they are. Litter #1 LUNA & STORM Born Feb 14th on Valentines day. They are ready to go home now. 2 pictures below of the same female lemon apricot with a natural bob tail. Her apricot markings will get darker as she grows. These lemon apricot puppies are harder to find since most breeders do not have them. Based on her size She will be 14-16lbs full grown. She is 5lbs now. Litter #2 PEARL & STORM Born Feb 24th. #1 male lemon apricot below. His markings will get darker as he grows. These lemon apricot puppies are harder to find since most breeders do not have them. He has light/hazel eyes. He will be approx 18lbs. #3 male lemon apricot below. His markings will get darker as he grows. These lemon apricot puppies are harder to find since most breeders do not have them. He has light/hazel eyes. He will be aprox 22lbs. 2 pictures of the same male black tricolor calico (some brown showing throught the black) below with full tail. Also showing some faint black through the white. He will be 20-22lbs. Litter #3 AMBER & STORM Born March 7th. Ready for their new homes May 2nd. Adult size: 16-18lbs. They are 3lbs. now. We breed all year. Rat terriers love the snow!